As Greece receives yet another EU funding bailout, the prime question remains – To what extent will the country be able to overcome its overwhelming economic problems? Can it deliver on the Eurozone’s requirement to reduce its public debt to 120.5% of GDP by 2020? Greece’s capacity to overcome the current economic crisis rests on its ability to tackle the endemic cartelisation and corruption present in the current Greek political system. Already, voters are moving away from the larger parties that have dominated the political scene since 1977. But this may also bring about a potentially worrying swing towards the parties of the far right and far left. Whether Greece can implement significant economic reforms is primarily a political issue and the outcomes achieved will depend largely on party politics. More specifically, there is a trade-off between providing economic solutions on the one hand and retaining political accountability on the other. Most modern democratic systems tend to be characterised by an adversarial government and opposition dynamic, whereby each party represents the interests of their voters. In clientelistic systems, such as the Greek polity, however, this dynamic is lost. This is because the voter-party relationships tend to be mediated by corruption. In Greece, examples of historical divisions between clearly defined social groups are limited and the distinguishing line between them is blurry. It does not necessarily cut along lines of socio-demographic characteristics. What tends to define voting patterns is that Greek voters choose parties not on the basis of ideological and/or class divisions, but rather on the capacity and willingness of the party to provide patronage, i.e. to operate a spoils system where government-allocated benefits or ‘rents’ of various kinds all depend on a person or family having political connections. For example, the government job market is often governed by nepotism, with job posts often opened up in the public sector so as to serve voters of the two main parties, known in Greece as the ‘green’ (PASOK) and ‘blue’ (New Democracy) children respectively. There is widespread lack of transparency in public affairs and increased levels of corruption in competition bids for the purchase of materials intended for state owned utilities and welfare purposes, such as defence equipment, telecommunications and health. This system of politically-flavoured favouritism is reinforced by the nature of the Greek two-party system, where the centre-left PASOK and centre-right New Democracy alternate in government and together make up a very large percentage of the parliamentary seats. In the 2009 elections the two parties together accumulated 77.4 percent of the vote, translated into 251 seats out of a total of 300. This result does indicate a small decline from previous years – for example, in the 2004 and 2000 elections, the two parties gathered over 85 percent of the votes cast, taking up respectively 282 and 283 parliamentary seats. 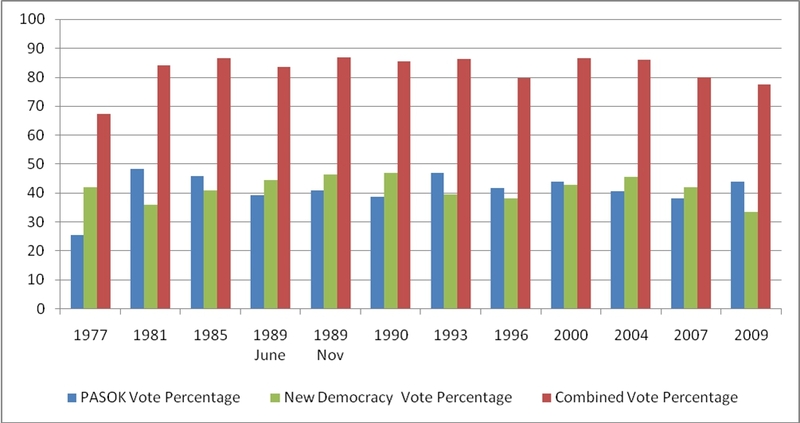 However, as Figure 1 shows, it is clearly the case that since the end of the dictatorship in the 1970s PASOK and New Democracy have between them monopolised Greek politics. This pattern has long sustained a cartel party system, characterised by a division between the two mainstream ‘cartel’ parties that dominate the political scene in terms of votes, partly because they alone have access to the ‘rents’ of office. Meanwhile the non-mainstream parties receive only a small percentage of the votes cast and have very limited political clout. the existence of much ineffective legislation which makes illegal rents attractive. However, the implementation of any of the above policies runs flatly counter to party cartelisation incentives, because such measures are bound to hinder the future political and electoral opportunities of the cartel. Recent opinion polls suggest a general political disillusionment amongst the Greek public and an increasing fragmentation of the party system. Figure 2 below shows that a recent opinion poll places PASOK at its lowest ever level of 8 percent support (reflecting its being in government as the crisis deepened), and New Democracy at 31 percent. Smaller parties are faring better in comparison to previous years, including the radical left-wing parties KKE at 12.5 per cent and SYRIZA at 12 percent, and the radical right-wing party LAOS at 5 percent. Interestingly, 18 percent of the respondents intend to vote the newly established ‘Democratic Left’. 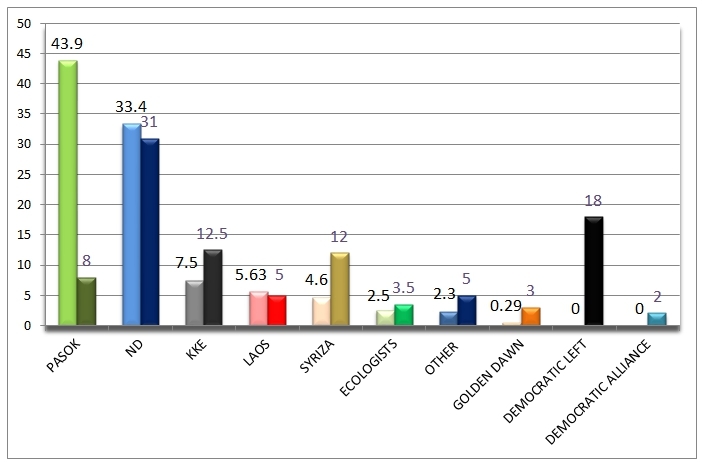 Other smaller groups are also on the rise, for example the neo-fascist Golden Dawn has an alarming 3 percent support, which is the threshold for winning seats and entering the Greek parliament (see Figure 2 above). Quite clearly, voting preferences indicate a trend towards partisan dealignment, a collapse of the PASOK party (at least in the short term), the fragmentation of the left and the rise of right-wing extremism. Greek elites have exhibited a continued inability to tackle the country’s economic problems, despite increasing political and social unrest. In the end it is this tension between successful economic solutions and retaining political accountability that defines Greek politics. Solving this problem would require a long-term process of detachment from patronage and clientelism, a reform that is not simply institutional, but would entail more deeply rooted generational and systemic changes. If the Greek socio-political system does not detach itself from cartelisation, and if voting behaviour continuous to be based on ‘rent-seeking’ and favouritism, achieving an economic solution to what is fundamentally a political problem will remain a futile task. Daphne Halikiopoulou is Fellow in Comparative Politics in LSE’s Department of Government. She obtained her PhD from the LSE in 2007. Her area of expertise is in comparative European politics, British politics and qualitative methodology. Her research focuses on the sociology of religion, nationalism and its relationship with the extreme right and extreme left, immigration and the criteria for inclusion in the nation. She is author of Patterns of Secularization: Church, state and Nation in Greece and the Republic of Ireland (Ashgate, 2010) and (with Sofia Vasilopoulou) of Nationalism and Globalisation: Conflicting or Complementary? (Routledge, 2011).